Our Best Selling Aero Mist Filter 52505 attaches directly between your standard 3/4" hose and your outdoor faucet. 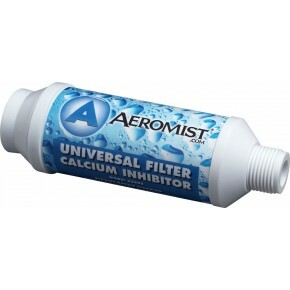 This Aero Mist Universal Filter is a great choice any time you need to filter water from your outdoor faucet to any of your outdoor misting system or mosquito misting systems. Additionally it is a good choice for use when filling your outdoor mosquito misting system with water. This will help to keep sediment from accumulating on the area you are misting and/or keeps your nozzles from clogging. If you have hard water, well water or any other water quality issues, this is the perfect item! This Low Pressure Filter Connects to Ordinary Garden Hose Bib. The universal filter reduces nozzle clogging by trapping sediment and minimizing mineral buildup. The male pipe thread fits a garden hose adapter. Hose Adaptor NOT INCLUDED Please choose in Pull Down above. 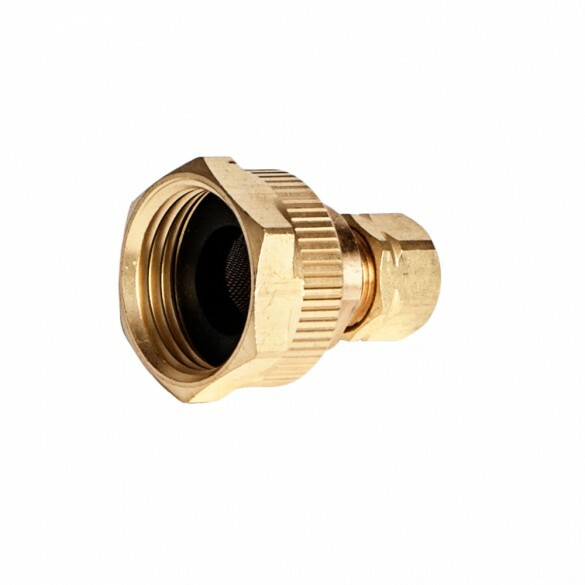 This adaptor allows you to connect your mist system to a garden hose or Universal Filter shown above.